Positive attitude at work is something bosses look for in every employee. It is these very qualities that makes some more welcomed into any team, loved by your bosses and envied by colleagues. Are these attitudes so difficult to possess or learned? Frankly, it is really up to the individual - whether the person wants to learn it up or not, or even if that person is ambitious. More often than not it is because people want a short cut to success, are insincere in their pursuit for better positions that they fall flat on their faces. Assuming you are of the right thinking, you are sincere and willing to work hard, what then are some of the common expectations from bosses? What will make them take notice, perhaps even consider you for a promotion? Remember, out there – there are full of people who will only do enough, too lazy or expect things to be delivered to them. If you have the right frame of mind, here are some tips you can use in your daily routine. This means getting involved. No matter what is your rank, always be prepared to get your hands dirty. That means really doing the work. Roll up your sleeves when you see a crisis looming, colleagues scrambling for a solution, managers in desperate need of assistance. These are perfect time to let your skills and knowledge shine. Do not view your colleagues as competitors as that will mar your decision making at work. View them as team mates and when something happens to the team it hurts you too. Learn to have a view on things and voice it when the time is right and appropriate. You are not just employed to do the work; you are also employed to give solutions to make things better. Form opinions and generate ideas that can help make the company better. Do not think you are low ranking hence your opinion won’t matter. That is not true. Also, learning to have an opinion and generating ides when you are young at work will also prepare you for higher rank work. That is a positive attitude at work to have that bosses will like. It means more than just working with others in a seamless manner. It also means being able to learn to share credit when credit is given to the team. Very often people like to hog the limelight and are unwilling to cooperate since the success may need to be shared. But think about the overall effect of your actions on the company. Bosses will realize that you can contribute but are unwilling to cooperate as you know you may have to share credit. This sort of attitude will hold you back. You learn more and achieve more when you cooperate. You may think this is funny. Why would you need to keep up with news on business, technology and trends especially when you are new? This positive attitude at work is not just relevant to the newbie but to managers too. In this day and age, bosses expect everyone to know what is happening in the world around them. A flood in Pakistan may affect the sale of your company’s product; a growing trend in China may mean new market for your company. All these are basics of the working world. The more you stay informed the better you can contribute. You want to move up in the corporate ladder? Be the driver of your own growth. There is only so much your company and your boss can do for you. When your boss sees that you take the initiative to grow yourself through exposing yourself to new ideas and people or even reading, you would have made a positive impression. Get feedback from supervisors and colleagues and see how you can improve. Take on challenges that will spur your growth even if it scares you. Positive attitude at work is not difficult to do. It really depends on whether you want to do it or not. Developing positive attitude at work can determine how successful you are in your career. However, this can be tough especially when things seem to go wrong all the time. As a new executive in the workforce, you need to find the right attitude for career success. Here are 7 straightforward strategies to help you enhance your career. Did You Define Your Attitude At Work? You may have your entire career plan worked out, but if you do not define your attitude to build its foundation on, then before long your plans will crumble. A compilation of over 100 positive attitude quotes by famous persons. Work attitude is often seen as a key determinant of your career success. Which work attitude should you work on? Your definition of attitude determines your career altitude. What is the approach you take towards your career? Many of us fail to see that simple positive work behaviors practiced early can help in moving up the corporate ladder. Here are 8 new tips for making that career head start. Work attitude behavior and work behavior attitude is not necessarily the same. Why is it important to understand the difference? Your positive attitude in the workplace determines how far you can go in your career. Have you thought about what are some of your positive attitudes at work? Some companies conduct work attitude values enhancement programs for their employees. As a newbie, you can use these values as your own personal work attitude values enhancement principle. Cultivating good general attitude at work can determine how high your career can fly. For more positive attitude at work articles like this, click here. 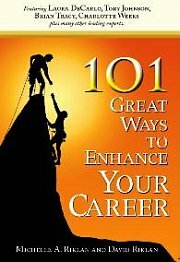 3 years ago, I was invited to participate as a contributing author together with 100 other career experts to create a book called 101 Great Ways to Enhance Your Career. In my chapter, Work Attitude, I discuss how you need to define your attitude at work as critical step to career success. You will be getting career advice up close an personal from some of the best people in their fields like Brian Tracy. Every month, we bring you new articles based topics suggested by you. We hope to be able to give you tips and suggestions, and provide answers to your questions that you will find helpful.